I’ve spent the better part of this week thinking about that word, and I’ve discovered that for me, it brings up 3 very distinct lines of thought. I used to say I was an extroverted introvert. A social butterfly who’d rather be, and sometimes is, a fly on the wall. In high school I ran with a number of different groups. I wasn’t the popular girl, I just played up different sides of myself depending on what circle of friends I was with. It was exhausting. By the time I was in college I found it easier being a part of a large group, but as people we organize ourselves into smaller sets. Always, I found myself feeling rejected. Wishing I didn’t give a shite what others thought. Then one day I was listening to music and I had an epiphany: ALL friends are just intimate strangers. 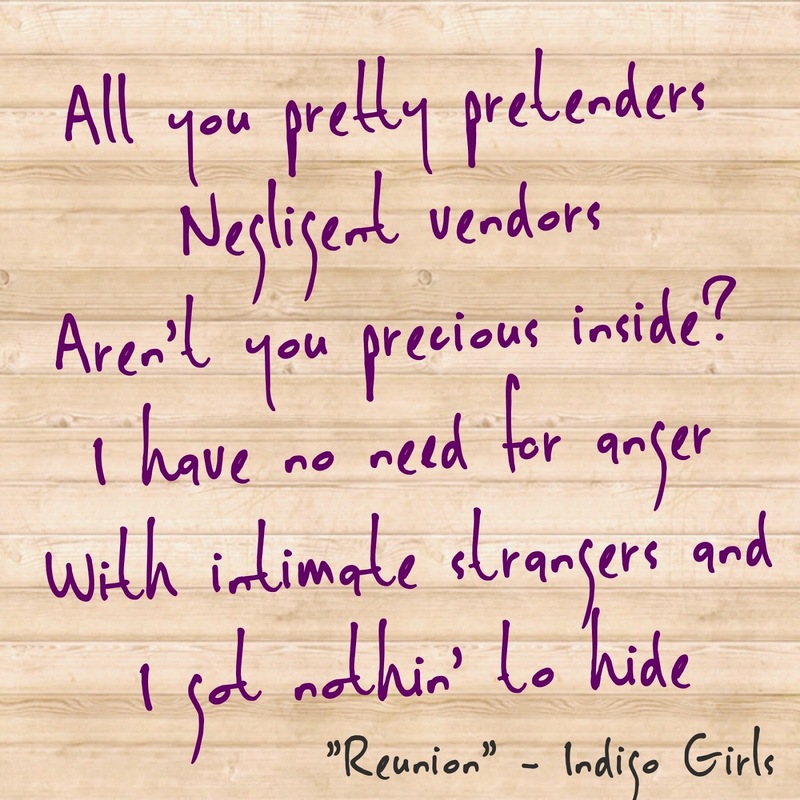 I made that connection & realized the Indigo Girls were right, “I have no need for anger with intimate strangers.” It may sound silly, but I was freed. My view on friendship is now always through this lens. Which is to say: if you are happy with yourself, proud of how you conduct yourself, then hang the rest. The people who value that way of being will stick. We all change, when you think about it. We’re all different people all through our lives, and that’s okay. You’ve got to keep moving, so long as you remember all the people that you used to be. At the risk of sounding uppity or insanely geekazoid, I view myself rather like The Doctor. I’ve regenerated several times over the course of my life. I’m fairly certain I will again. But I’ve got all those other lives inside me. I honor them all because without them, I wouldn’t be – I couldn’t be – me. This quote from Doctor Who is such truth. We ALL change & grow, all throughout our lives. Sometimes our relationships are invigorated, sometimes they are unaffected. Often, however, such change means friendships end. Not in a blaze of glory or other drama. Then one day you remember someone who used to be there. Like Kevin Costner’s character in Fandango, someone has just faded away. Sometimes I find I’m like The Doctor, and I’m the one who has left my companion, imagining I’d never come back. I reckon I’m not alone in saying in my day to day life I am connected to literally all my friends almost exclusively through social media. Some, like my SisterCat, I only see a few times a year. Some, sadly, I may never see again. Some of my closest friends I will never meet in person because this world of social media has given me extraordinary new friends. It has also helped me renew friendships with people I thought were lost forever. People who knew a different me. An earlier version. In my early days on Facebook I reconnected with a few of my best friends from 4th grade. Kids I met at about age 8 or 9, I guess. I found it remarkable that we are much the same as we were in grade school. Grown, different in ways I didn’t anticipate, but still the same. We were a military family, which I credit with why I don’t have friends from my early childhood. The year I started 4th grade was when we moved to Governors Island, a base here in NYC. I was twelve when my family left. Several of the friends I made during that time became “lifelong” friends. Did those bond stick because we were all military brats who knew the drill, or because we tried harder because of our semi-nomadic lifestyle? 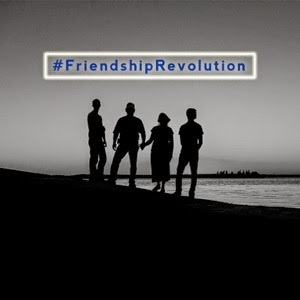 Or is it like Stand By Me – we never have friends again like we did when we were twelve? The most important part of friendship is being true to ourselves & honest with our companions. Friendship, like Life, is Dynamic. The friendships that end aren’t any less important than the ones that last. Each person we take as our companion has the potential to alter our perspective. This is to be valued regardless of how the friendship started, how long it lasts, or how often you get to share space. “The most important part of friendship is being true to ourselves & honest with our companions. The friendships that end aren't any less important than the ones that last. Beautifully worded, meaningful, and poignant. I love your thoughts on friendships. While reading, I found myself agreeing more and more. Army Brats think alike, I'm afraid. The Doctor Who reference made me want to dig out my old cd's! Love you, Sweet Mama!